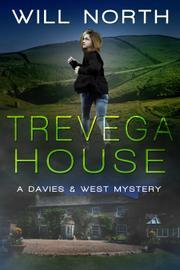 Trevega House by Will North is the third book in the Davies & West Mysteries set in Cornwall, England, and it is as solid a mystery as they come. Book three has catapulted this series into serious contention as an award worthy one. There is much with which to be satisfied and captivated in Trevega House. North has great talent in creating characters in whom the reader becomes invested. Morgan Davies and Calum West head the list of these characters, but most authors can do main characters well. Will North shows his character genius in bringing to life even the most minor of characters, with a special knack for the circle of characters directly surrounding Davies and West. And, in this book, we are even given the pleasure of revisiting some characters from another book of Will North's, not in the Davies & West series. Of course, descriptions of the Cornish countryside are another area of author expertise, borne out by the fact that North has spent enough time in Cornwall (and Devon) to actually have written walking guides to the areas. The descriptions are never heavy-handed, just particularly enough to ensure the charm and beauty of Cornwall shines through. And, then there is that other skill in storytelling that the author possesses to make a complete success of this book. The plot is smart, even-paced, engrossing, and unpredictable, and the story is written with a voice that echoes the old and embraces the new. So, all the bases are covered to result in, as I mentioned at the beginning, a solid success of a read. Nicola Rhys-Jones and Andrew Stratton (from the novel Water, Stone, Heart) and their twelve-year-old nearly adopted daughter Lee are living in Trevega House, just south of the historic artists' colony of St. Ives in Cornwall. It has been three years since the massive flooding of Boscastle and the death of Lee's parents. Andrew, an architect, is still learning the art of stone wall building, and Nicola, an artist, is bringing the estate's garden back to glory. Their safe haven has been provided by Nicola's ex-father-in-law, Sir Michael Rhys-Jones, who owns the house and surrounding lands and loves Nicola like a daughter. But, the safe haven is under threat. Lee, who is already stunningly prescient and getting more so, warns that "Someone wants to do us harm. Someone evil"
The discovery in a pasture on the Trevega estate of a bullock with its throat savagely cut and left to bleed out is found by Lee he escalation of danger to a burning building on the property next and a near miss of someone dying in that fire, there seems to be more to investigate and less to dismiss. More threatening incidents follow, and at last a murder occurs in the area. The connections are too close to ignore, and the tearself. Close inspection reveals that the bullock was killed by someone who meant maximum harm. With Sir Michael being a close friend of DCI Arthur Penwarren, the DCI calls in Davies and West to visit the scene of the killing. As expected, Detective Inspector Morgan Davies is not happy to be sent on such a case and views it as quite beneath her skills and concern. However, with them at Bodmin faces a challenge of rooting out a person who may have gone from murdering an animal to murdering a human being. Watching Davies and West and the rest of the team work is a suspenseful thrill, the interrogating and forensics leading to and away from suspects. I received a copy of Trevega House from the publishers for an honest review. I can assure readers that this book is the real deal, what mystery/crime readers crave in their search for excellence. The Davies and West series is now a sought after series for those who like a little murder along their Cornish walking path. Thank you for that wonderful review of Will North's third book in the Davies & West mystery books. I'm so very proud of my brother. When I tell people about his books, I tend to say, your not really reading a book, your visualizing the place, and people as if it were a movie. It's so vivid! His talent of describing the landscape, and the people makes it so real! I have yet to be disappointed with his writing. I hope people will take notice of your positive review and make Will North their favorite author.